1. Girl Power. We are united in running in a group, all women coming out to meet for the same particular reason, working out together and sharing our motivation as to why we are in this 👭👭. 2. To have a fun run. Running releases endorphins but you just won't get the fun run alone🤣. 3. Girl chats. Okay so we know women love to talk and walk, you can do this at warm up and warm down, those with good cardiovascular even manage to have stimulating conversations whilst running. What's more we can share information such as sports bra's benefits and the likes . 5. Building Community. We beat social isolation as a run group, we are friendly and welcome all new members whether they are in it for the long run (pun intended) or a one off visit. We also get the opportunity on ground to share other relevant activities locally and on our whatsapp group . Can you think of any more reasons why Runtogether groups are the best motivator....? It's the best way to run as the group encourages, supports and motivates each other. Much better than running solo as it's a fun and friendly way to keep fit. Great encouragement to keep pushing further. Stronger together, keeping fit, healthy minds, working on our bodies and lifting our spirits. No matter what stage you are as a runner; when you run as a group there is always someone at a similar level to yourself. Therefore you are never alone. More than just the motivation, it is the new friendships that are formed and companionship of the group. Fly girls is a great team who have similar goals and objectives to stay healthy. I love running with the lovely ladies and feel always motivated to fly high!! 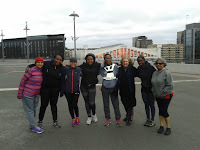 Running together, running stronger, running in a group such a the Fly Girls is a great way to get started if it seems a bit daunting starting out on your own. The support, encouragement, togetherness and motivation that is shared is fantastic, as is making new friendships and being able to share experiences, advice and chat about life in general. It has certainly lifted my spirits and I love running with this group of fabulous women. It's so worth it...give it a go..